If there's one trend you can pretty much guarantee will back in fashion each spring, it's the craze for all-things nautical. And s/s12 is no different thanks to Yves Saint Laurent's Resort collection that came complete with breton stripes, cute anchor prints and chic Riveria-inspired gold jewellery. So to get you ready for spring, here's my pick of the best designer and high street nautical inspired buys. Ships ahoy! 1. Yves Saint Laurent gold-plated starfish clip earrings, net-a-porter.com, £235. 2. Boat neck long sleeve striped t-shirt, Uniqlo, £14.90. 3. Oversize anchor necklace, ASOS, £15.00. 4. Stripe 4 pocket cardi, Warehouse, £40.00. 5. Yves Saint Laurent Riveria embroidered suede wedge sandals, net-a-porter.com, £550. Hi, I love the detailing on these shoes. Great blog! 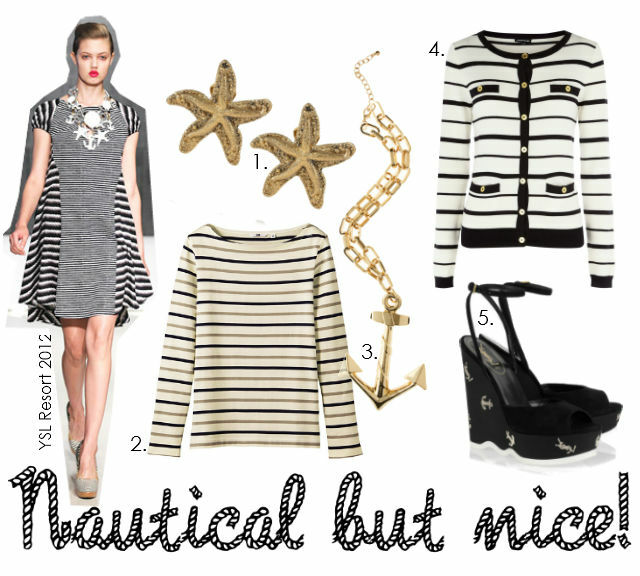 Yay for nautical! Those shoes are so beautiful, I need them. Adorable earrings, love the nautical motive. I'm totally digging the nautical look right now. It's so cute and fun. I love those earrings!! i think the dress of Kate is the most beautiful maxi dress i've seen...so gorgeous!! !